Athletes have used sports as a stage to perform and as a platform to speak. Those speakers who had the greatest effect needed a partner or adversary, and a great stage to make their voice heard. Jackie Robinson had Branch Rickey and Major League Baseball, Billie Jean King had Bobby Riggs and the Houston Astrodome, and Jesse Owens had Adolf Hitler and the Berlin Olympics. The greatest, at least in his mind, was Muhammad Ali. And he had Howard Cosell and Wide World of Sports. Heavyweight boxing champ Muhammad Ali, paused on the step and greeted a friend, March 17, 1966, as he arrived at the Veterans building to appeal his 1A draft classification. Behind him, dark coat and hat, is his attorney, Edward Jocko of New York. 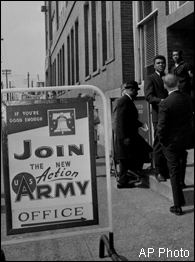 In 1967, Ali declared himself a conscientious objector and refused to step forward to be drafted by any branch of the United States Armed Services. As a result, he was stripped of his World Heavyweight title, ridiculed by the press and prosecuted by the government. Ironically, it was a former lawyer and World War II veteran turned sports broadcaster named Howard Cosell who first publicly backed Ali's position. The long journey began the day after Cassius Clay's beating of Sonny Liston in their first of two bouts to win the heavyweight championship. It was then that Clay confirmed to reporters that he had become a member of the Nation of Islam and that its leader, Elijah Muhammad, bestowed the name Muhammad Ali on Clay during a radio address on March 6, 1964 because the name Cassius Clay lacked any divine meaning. When the military attempted to draft Ali, he declared himself a conscientious objector. "I ain't got no quarrel with them Viet Cong," he said in 1966. Appearing for his scheduled induction on April 28, 1967 in Houston, he refused three times to step forward at the call of his name. An officer warned him that he was committing a felony punishable by five years in prison and a fine of $10,000. Once again, they called Ali, and once again, Ali refused to budge. Refusing to speak about his status, Ali issued a written statement. And he only stood with ABC Sports announcer Howard Cosell, while he summarized his words for the world. "The action he (Muhammad Ali) has taken is based on his deepest personal convictions and he is aware of the possible implications and consequences," read Cosell. "He says he hopes to immediately resume his boxing career, that he won his title fairly within the four corners of the ring and that this is the only way he can be deprived of it. He is also aware that certain authorities in the world of boxing will seek to strip him of his title. This is not all he said because he also thanks many people for what they have done for him, but I think that this is the nub of what he said. Champ is this true?" Cosell: "You have no regrets or misgivings of any kind?" An hour after Ali refused induction, the New York State Athletic Commission suspended his boxing license. The rest of the boxing world followed suit, and Ali was stripped of his heavyweight title. "It was an outrage; an absolute disgrace," Cosell said when referring to the boxing commissions' stripping Ali of his titles. "Due process of law hadn't even begun, yet they took away his livelihood because he failed the test of political and social conformity." It was this refusal, along with his religious convictions, that led to a fight with his most determined opponents, Uncle Sam. The law requires that in order to qualify as a conscientious objector, a registrant must show that he is conscientiously opposed to war in any form, that this opposition is based upon religious training and belief and that the objection is sincere. Initially, the state draft board denied Ali's application and referred the file to the United States Justice Department for a recommendation. The Justice Department then conducted a review of the file as required by the law. The law requires two things for a review of conscientious objector claim. First, the FBI must conduct an inquiry into the objector. Secondly, a hearing -- conducted by a hearing officer appointed by the Justice Department -- must be held to determine the character and good faith of the objector. Muhammad Ali stood next to Howard Cosell in April of 1967 while Cosell summarized Ali's written statement. Howard Cosell summarized Ali's three and half year battle with Uncle Sam.